Hello, forex friends! If you missed the latest FOMC statement, or if you just want a quick rundown on the key points, here are 5 takeaways from the June FOMC statement that you need to know about. 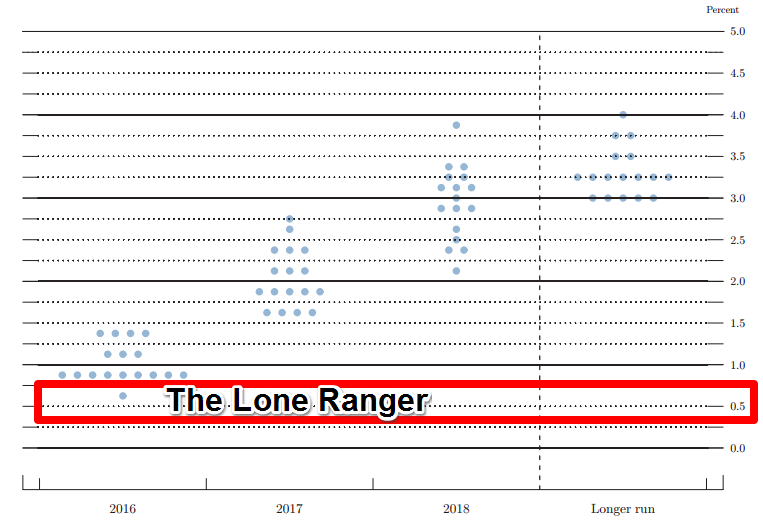 Kansas City Fed President Esther L. George has been the most hawkish voting member of the lot, so much so that she was the only one who voted for a 25 bps rate hike during the March and April FOMC meetings. Well, it turns out that she’s a hawk no more, since she voted to keep rates steady, as you can see below. As you can see above, Fed officials downgraded their GDP growth projections for 2016 and 2017, with 2016 GDP now expected to grow by 2.0% (2.2% originally) while 2016 GDP is expected to also grow by 2.0% (2.1% previous). On a more upbeat note, Yellen said that “Indicators for the second quarter have so far pointed to a sizable rebound,” which is what I also concluded in my Snapshot of the U.S. economy. Fed officials weren’t too upbeat on growth prospects, but they were optimistic on inflation since they upgraded the projected headline reading for 2016 from 1.2% to 1.4%, but projections for 2017 and 2018 were maintained. As for the core reading, they upgraded their projection for 2016 from 1.6% to 1.7% and they upgraded their 2017 forecast from 1.8% to 1.9%. As noted in the press statement and Yellen’s opening remarks, the upgraded projections were due to the fading away of “transitory effects of past declines in energy and import prices,” as well as expectations that the labor market will strengthens further. She basically admitted that the recent NFP reports, especially the May NFP report, looked pretty bad, but she tried to play it off by implying that it was just an outlier and that the labor market will continue to strengthen. She therefore essentially repeated what she said during her June 6 speech. Four FOMC meetings down and four more FOMC meetings to go, and the Fed has yet to hike rates. Still, the Fed is saying that we can expect one to two 25 bps rate hikes within the year since the median path for the policy rate in 2016 is unchanged at 0.9%. However, Fed officials downgraded their rate hike projections for 2017 from 1.9% to 1.6%, which implies only four or five 25 bps rate hikes with the current 0.50% rate as the starting point, down from five or six rate hikes. Rate hike projections for 2018 were likewise downgraded from 3.0% to 2.4%, which suggests seven to eight rates hikes, with the current 0.50% rate again as the starting point, down from ten rate hikes. 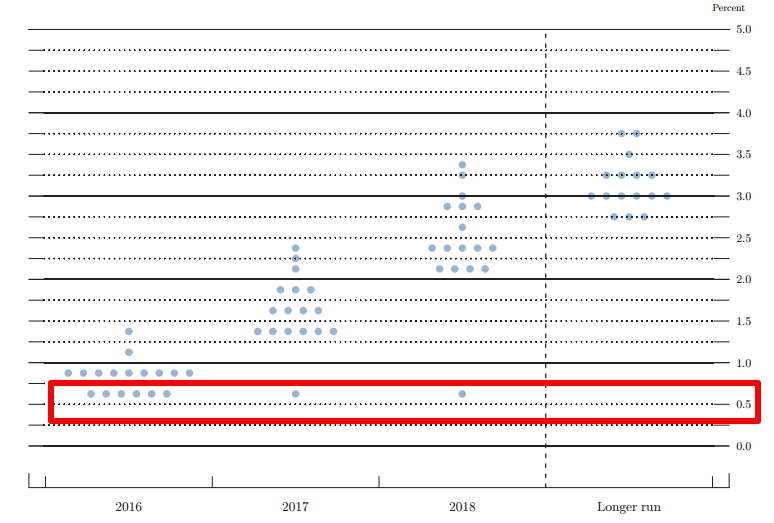 The dot plot that the Fed provided is even more revealing, since it showed that six FOMC members now think that the policy rate should only be raised to 0.625%, which means they would agree to only one rate hike at most. This is up from only one member previously, as you can see on the dot plots below. Also, somebody seems to be really dovish since he/she projected that the policy rate should only raised to 0.625% and then hold steady there until 2018. Given all that, are you still expecting a rate hike? If you are, how many rate hikes do you think the Fed will deliver? Or maybe you just feel vindicated because you have been saying that the December rate was just a means to boost the Fed’s credibility and was therefore likely a mistake or a “policy error” as some economists would call it. Share you thoughts by answering the poll or commenting below! As usual, you don’t actually have to do that since I already did that for you, but here it is, just in case you want to see the actual press statement with the differences highlighted. Do note that words or phrases in red are additions introduced in the June statement while those which have a strike-through are from the previous release. Information received since the Federal Open Market Committee met in March April indicates that (labor market conditions have improved further even as) the pace of improvement in the labor market has slowed while growth in economic activity appears to have slowed picked up. Although the unemployment rate has declined, job gains have diminished. Growth in household spending has moderated strengthened, although households’ real income has risen at a solid rate and consumer sentiment remains high. Since the beginning of the year, the housing sector has improved further continued to improve and the drag from net exports appears to have lessened but business fixed investment and net exports have has been soft. A range of recent indicators, including strong job gains, points to additional strengthening of the labor market. Inflation has continued to run below the Committee’s 2 percent longer-run objective, partly reflecting earlier declines in energy prices and falling in prices of non-energy imports. Market-based measures of inflation compensation remain low declined; most survey-based measures of longer-term inflation expectations are little changed, on balance, in recent months. Consistent with its statutory mandate, the Committee seeks to foster maximum employment and price stability. The Committee currently expects that, with gradual adjustments in the stance of monetary policy, economic activity will expand at a moderate pace and labor market indicators will continue to strengthen. Inflation is expected to remain low in the near term, in part because of earlier declines in energy prices, but to rise to 2 percent over the medium term as the transitory effects of past declines in energy and import prices dissipate and the labor market strengthens further. The Committee continues to closely monitor inflation indicators and global economic and financial developments.